John Frieda Sheer Blonde helps you go even lighter, brighter and blonder! 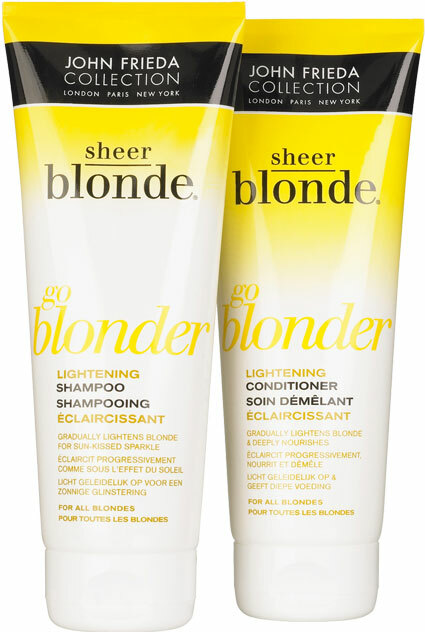 John Frieda Sheer Blonde Go Blonder Lightening Shampoo and Conditioner - 250ml - $12.99 - gradually lightens hair for a natural-looking lighter blonde with a lightening complex containing lactic acid lightening technology and chamomile which work to gradually lighten hair by breaking down colour pigments in the hair shaft resulting in a gradual, natural allover lightening effect. John Frieda Sheer Blonde Go Blonder Controlled Lightening Spray - 105ml - $12.99 - offers versatility and control by allowing you to choose where to lighten - whether it's root blending, allover lightening or creating highlights. With a unique blend of hydrogen peroxide and fixative polymers to deliver fast results for visible lightening in 3-5 uses and violet pigment that helps neutralize brassiness for a more natural blonde colour. It's easy to use, just apply to towel-dried hair and activate with heat - the more heat you apply, the faster and more noticeable the results. John Frieda Sheer Blonde Brightening Oil Elixir - 100ml - $12.99 - a lightweight oil that rejuvenates blonde hair to increase shine, colour intensity and improve texture. Specifically formulated for blonde hair with sunflower oil to brighten blonde hues and improve the texture of damaged hair as well as smooth the cuticle surface to reduce roughness and dryness leaving hair softer, silkier and easier to manage. Can be used on towel dried or damp hair - apply a few drops and distribute evenly throughout or use as a styler on dry hair - just a tiny amount to the ends of hair for shine and softness. Available now at all major drug, grocery and mass merchandise stores across Canada.